Attorney Lara is a hard-working, respected member of the Sullo & Sullo Criminal Defense Team, who not only defends assault cases, but also handles DWIs, drug possession charges, capital crimes and federal criminal appeals. 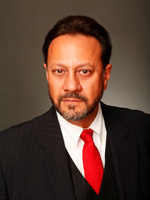 Patrick Lara graduated with a bachelor’s degree in Criminal Justice from the University of Texas El Paso, and has practiced criminal defense law for 22 years, receiving his Juris Doctorate from the University of Houston Law Center in 1994. Lara is licensed in Texas and New Mexico, in both state and federal courts, and has three acquittals for capital murder to his credit. Attorney Lara has represented clients in 10 murder/capital murder cases, with the most recent of those cases occurring in May 2017. The Houston-based Sullo & Sullo Law Firm has twelve attorneys and a twenty-five plus member staff to assist clients, pursuing the goal of becoming the best criminal defense law firm in Houston. With a reputation for exceptional personal attention, Sullo & Sullo recently received the AVVO Client’s Choice Award on February 22, 2019. Sullo & Sullo has more “Not Guilty” Jury Verdicts at Houston Municipal Court than any other law firm from 2009-2014 as well as in 2017. Since Sullo & Sullo opened its doors in 2000, they have had the privilege and honor of representing more than 250,000 clients. Sullo & Sullo is a full-service law firm that has the necessary experience to meet the needs of individuals and businesses in both the public and private sectors. Sullo & Sullo is proud of the many accomplishments of its attorneys and is pleased to have Patrick Lara as a valued member of its law firm.